… Visited Chicago. A beautiful, relaxed and entertaining city. The weakness of the dollar made things so pleasingly affordable. … Seen Kaki King and, also, The Tigerlillies. She was a bit dull, if worthy. They were hysterically anarchic and rude. Guess which one I preferred. 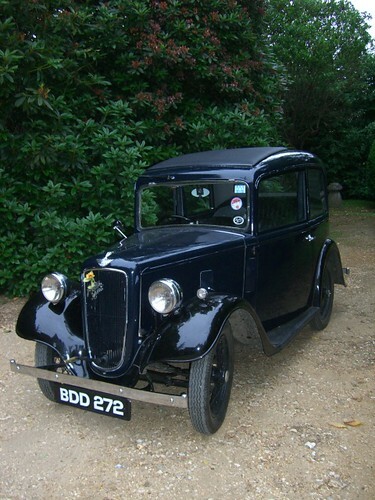 … Travelled in an Austin 7 to Dorset. All good fun: she’s a beautiful machine. But, and I say this lovingly, she’s built for neither comfort or speed. … Been to the dentist. If someone has to take the drill to your teeth, my advice: ensure she’s beautiful and Brazilian. … Watched Doctor Who Series 4 and it was definitely better than series 3. Catherine Tate pulled it off. Julian Bleach‘s Davros was faultless. The ‘story arc’ kept me gripped and Moffat’s two parter confirmed him as the right man to take over from RTD. Slightly lost now it’s all over. … Wondered why it has taken me so long to get into Jeff Buckley. Grace is a superb album. … Enjoyed having a girl around the house.